Images from the scene of a deadly traffic crash involving a pedestrian walking his dog on Oct. 30, 2015. Police are searching for three suspects believed to have robbed and stabbed a man waiting for an Uber downtown Sunday. The 37-year-old victim was waiting near 8th Avenue and B Street just after 2 a.m. when two women and a man approached him, according to the San Diego Police Department. The victim began talking to one of the women when she reportedly reached into the victim’s pocket and took his cell phone, police said. The suspects then ran off on foot. 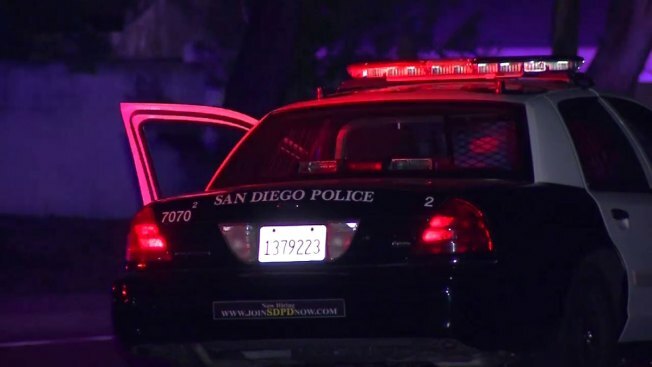 The 37-year-old began chasing the three suspects, and SDPD said when he caught up to the group, the man allegedly stabbed the victim in his right arm. At this point, officers said the victim noticed he was bleeding. The suspects then reportedly fled the scene in a red Chevy Camaro, headed westbound on B Street. The victim was taken to the hospital, though SDPD said his injuries were not life-threatening. The suspects were described as in their 20s, police said.